Another one of my lofty goals this year was to do a better job of wrapping up lessons at the end of class. I spent the latter part of my summer researching effective "exit strategies" to use. My biggest complaint/problem is that I literally teach from bell to bell. Most days, I don't even have 2 spare minutes at the end of class to provide closure for my students, which is bad...I know! I created an Exit Template and have it on sale for mega cheapo on my Teachers Pay Teachers site. It's already been a big hit, so I thought I'd share it with the blogging world. 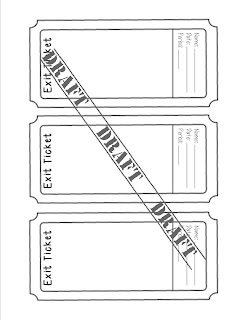 Simply add a text box to the template and use the Exit Ticket for just about any subject. Click on the Exit Ticket Image above to be directed to my Teachers Pay Teachers site where you can purchase the template for $1.50.